The Celestial Church of Christ. A baby naming ceremony. Church members have just danced around the huge pile of fruit. The child is being held by a 'spirit medium', to her left a 'scribe' translates the 'spirit mediums' prophecies for the child, she is speaking in tongues. The child's father records her message. The mother is considered 'unclean' and remains outside of the church hall in an anteroom with her other children. 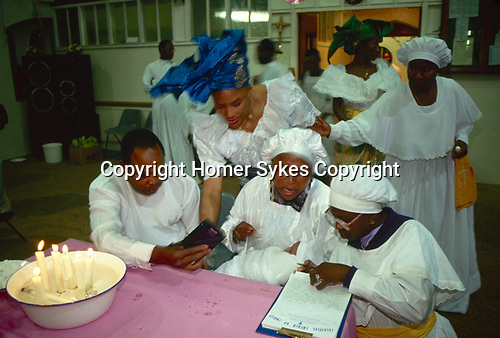 1990s London UK ( I am not sure whom the woman in the blue turban is, but she is not her the mother.